Your club will have received a newsletter from Pat detailing our Christmas closing times: 22 December 2018 and re-opening 15 January 2019. The Autodealer3 dealing machines, which required bar-coded cards, have been discontinued for some years now, and the time has come to end servicing. These machines have performed well over more than 25 years in New Zealand, and it is a testiment to their quality that they continue to operate. BridgeNZ have discontinued servicing these machines as parts are unavailable. If you are one of the few clubs using bar-coded cards for your autodealer3, and you wish to continue until the machine finally dies of natural causes, then we have a LIMITED SUPPLY of bar-coded cards available. We will NOT be bringing in new stock of bar-coded cards, and these will be sold on a first-come first-served basis for those using the autodealer3. This year has seen some exciting new features introduced into Scorer 18. We continue to add features and reports to help clubs and users. If your club has not yet updated, then please contact Pat for more information on the update process. Remember that it is an easy process to copy the calendar from one year to the next - no need to re-enter all your events; just the click of a button. See details here or just read the "END OF YEAR HINTS" in the Scorer Help menu. These events are easily modified in the calendar with the edit tool. There are now a significant number of clubs using BridgeTabs, as they are, arguably, the best and certainly the most economic solution for clubs, removing the reliance on specific hardware and allowing clubs to use off-the-shelf android tablets and standard wireless networking. There are updates for both the BOS system used AND for the android tablets. After download, extract the install files and install - if this is a problem then please contact BridgeNZ for assistance. When the update is done, the BOS icon will be a green square contining a red heart. This differs from the old version of BOS which was a yellow circle with BOS written within the circle. BridgeTab updates, if they do not happen automatically on your tablets, can be done by going to google play store and searching for Bridgetab, then update. The latest version is 1.72, and this will show on the welcome screen of the BridgeTab when updated. Scorer 18 continues to develop and more information is directly in the database. The major changes are in performance, the availability of more movements, and the ease of generating and importing custom movements with the “new custom movements” tools. We have listened to users and instead of automatically offering the player update on every login, this option has been removed and the player update is offered as a button on the front ribbon bar. Users will no longer be prompted on every login to update the player list. NOTE: As a consequence of this it is now the user’s responsibility to ensure the player names are updated on a regular basis. Excel templates are provided to assist in generating some movements, and training is available on request. When movements have been generated or created, they are stored in the SQL Server database and are available for use. The movements are checked to ensure that no pair plays any board more than once. Creating csv files for the movements is best as this allows users to share their movements easily with others. When a pairs session is created, there is an additional option “New Custom Movement” available along with the “Mitchell”/”Howell/Barometer” and “Custom Movement” options. The old “Custom Movement” option still works currently, but this is more difficult to use and has less flexibility than the New Custom Movement option. With the New Custom Movements, when a movement is added, there is a button on screen to print an overview of the movement and guide cards direct from the database – no need to make your own! The overview is a table showing, for each table and for each round, which NS Pair, EW Pair and boardset are at the table for that round. The guide cards are printed for each table. The process for uploading results from electronic scoring has been slightly modified to improve performance. This should be especially noticeable in larger sessions. There have been some instances where long event names have corrupted the Master-Points files. This has been corrected in this version. With V18 the power of the database has moved another step forward, removing the use of system files for Pairs as well as teams events. This means no more file locking when it comes to those important changes that happen from time to time at the start of a session! Having the data in the SQL Server database makes the reporting for your club and for your players so much better, and control is in YOUR hands. The Laws of Duplicate Bridge are required, by the consitiution of the World Bridge Federation, to be reviewed at least every 10 years. The latest review is complete and ratified and BridgeNZ have published the Laws in New Zealand. Implementation in NZ is 1 August, 2017. CHANGES HAVE BEEN MADE BY WBF. BridgeNZ has now implemented X-IMP scoring where the total X-IMPS are divided by the number of comparisons. For Swiss Pairs the total of these X-IMPS, rounded to the nearest IMP, is converted to VP's. 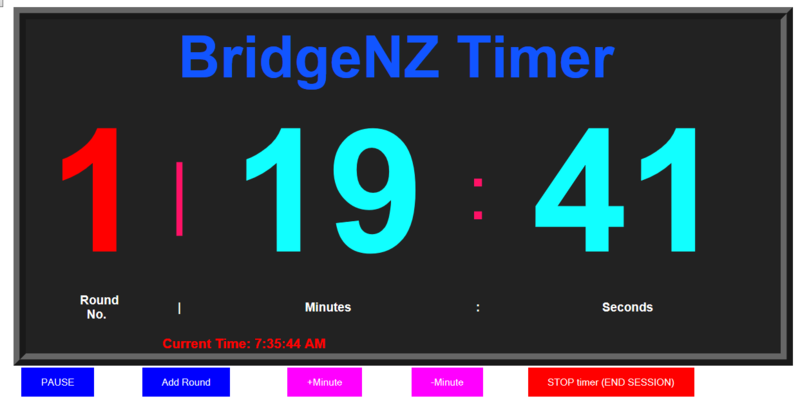 BridgeNZ has released a free timer clock for those with internet connection. This is available from the BridgeNZ web site menu or Scorer can start this from the session. BridgeTab has been released by Jannersten. The two devices (BridgeScorer and BridgeTab) will seamlessly operate together in a session, as they use the same control** software. BridgeTab Android software is free (from Google Play Store) and server licencing is very reasonable. The BridgeTab works on any android phone or tablet connected to a standard wireless network so no more custom hardware required.